Taro’s family are all killed by invading soldiers, but the captain saves young Taro alive to be a servant. Taro vows to become a samurai, and regain the wealthy position his father once held. He begins as a lowly kitchen boy, but quickly is placed in higher positions of trust. He gains the respect of men in power and slowly rises in the ranks to follow his dream, but the shifting wars in Japan threaten to destroy everything he knows. I wasn’t surprised that there is a lot of violence in this book, since it was a bloody era in history. I thought it was handled well though, without being unnecessarily graphic. The writing treats the death and destruction of these 1570s Japanese wars with an admirable gravity and respect. Although is it unpleasant and sad to read about, knowing that this history truly happened, I think the level of violence is still appropriate for middle grade or YA readers. Tons of people are beheaded, beginning with Taro’s mother and brothers. 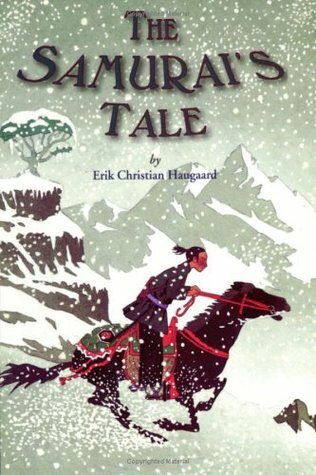 Taro witnesses their murders as a young child, and carries that scar with him into his young adulthood, making him a much more compassionate person than most of the other samurai. He doesn’t crave battle as some of the other soldiers do, because he has seen the crushing loss that follows violence. This compassion is one of Taro’s most attractive qualities as a main character, and he is also loyal and upright when others are sneaky and duplicitous. This makes him stand out from the crowd, and earns him respect from those in authority. The writing style is very dry, which makes it a little difficult to get into the story at first, but by the middle I was fully invested in Taro’s story and was cheering him on right to the end! One of the good things about this book is how historically accurate the setting is, but it also creates complications because all these Japanese warlords have very similar sounding names, and often the sons are called by the same family name as the fathers, so it becomes difficult to keep track of the many characters and who is at war with whom. I was often confused by various Japanese words and terms that were used. They are sometimes explained within the story’s text, but other times just left there with no explanation. I could mostly figure out what was meant through the context, but I wish there were a glossary at the back. It’s as though the author is so familiar with Japanese culture and history that he expects his readers to have the same knowledge, so doesn’t bother to explain or elaborate. All in all a wonderful story and well worth the read!